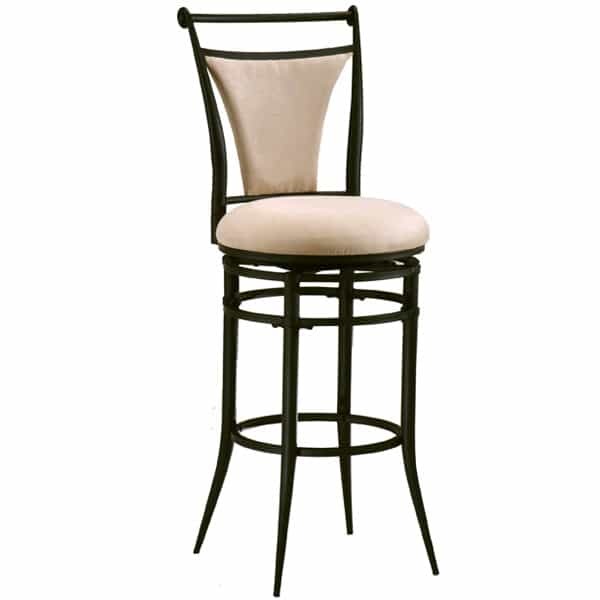 Hillsdale's Cierra Fawn Bar Stool is a striking metal chair that is a study in contrasts. The inky black powder coat finish contrasts with the creamy fawn upholstery, the sturdy metal frame is a contrast to the plush padded seat and the back rest that tapers in is offset by the legs that taper gracefully out. The result is a visually pleasing design that will equally complement a kitchen counter or game room bar. This innovative stool is designed and engineered to give you years of use. The Cierra offers a 360 degree swivel for ease of use. This item ships via UPS / FedEx. Most delivery times within the Continental U.S for in stock bar stools range from 2-5 business days depending on location. All in stock bar stool orders recieved before noon will ship that SAME DAY.